if the blood splatter on the lens wasn’t enough, then the eyeball flying toward the camera [see here, but only after you’ve had your breakfast] should be.” So that’s what we’re dealing with here: At one point, just the fact it actually came to fruition would have been enough; now, though, this thing is barreling into theaters (it’s out November 2) with some steam. Now here’s some more good news for Bobby Digital’s first flick: The track list for the soundtrack has been released, and it pretty much slays. RZA and the “Thug Waffle” guys! Rae, Ghost, and Kool G. Rap! What is, I hope, the first full-clan Wu-Tang track since 2008’s sickly underrated 8 Diagrams! A new solo ‘Ye song that may well be about some garment of Kim’s he really likes! And best of all, not a single track from 30 Odd Foot of Grunts. 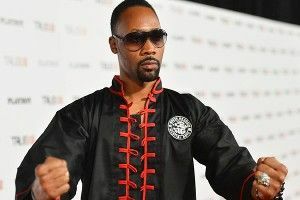 Speaking to The Hollywood Reporter about Iron Fists, RZA explained that, exhausted after writing and directing the project, he had hoped to drop the duties for the score on someone else. When the producers asked him to do it, RZA, aghast at their chutzpah, went to big brother Quentin Tarantino to complain, who then calmly pointed out, “Bob, who else is gonna score it?” The point here being that, unless RZA somehow rips off a long string of cinematic marvels, it’ll always be the tunes he’s known for. Therefore, his primary duty on Iron Fists, above all else, was to make sure that music, whether it’s for the soundtrack or the score, was truly bong-bong. So far, so good.